My apologies for the large gap between posts! Sometimes life just takes you in different directions. Once you make your grocery list and are meandering around the aisles, there are a lot of different words or advertising slogans brands use to promote their products. Lets break some down..
“From a food science perspective, it is difficult to define a food product that is ‘natural’ because the food has probably been processed and is no longer the product of the earth. That said, FDA has not developed a definition for use of the term natural or its derivatives. However, the agency has not objected to the use of the term if the food does not contain added color, artificial flavors, or synthetic substances”. So to break it down, it pretty much means it hasn’t been artificially added but because it is not a regulated term it can still be thrown around without being verified. The danger I commonly see with these labels is while foods may be low in fat or calories, it is not low in sugar-even artificial sugars! I am a firm believer that it is not fat that makes you fat, sugar makes you fat. Look at the picture above at the comparison of the brains reaction to cocaine and sugar compared side by side. Pretty shocking! The World Health Organization recommends getting just 5% of calories from sugar which translates to about 25 grams. 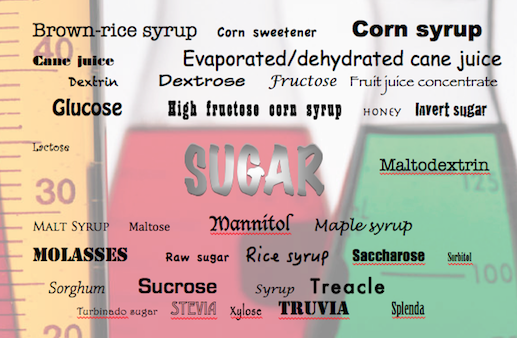 So while labels may say “reduced fat” be sure to check the sugar content! Chances are high if fat has been taken out sugar is added back in, whether artificial, real sugar or HFCS or whatever they can get their hands on. Lastly, many people question the term organic. Organic farmers are held to strict standards and ongoing evaluations to be sure they are meeting the strict requirements to be deemed organic. I am a fan of organic foods-it helps the local economy and environment, keeps harmful chemicals out of the body, and more often than not the food tastes better. Look for the USDA Organic seal when shopping and you can sure the food is organically grown. This recipe was sort of made up as I went, with simple ingredients from what I already had around the kitchen, except for the green enchilada sauce. This is another example of easy ways to sneak in more veggies into your diet for optimum nutrient levels. For modifications, I used a lettuce leaf as well instead of a tortilla just to experiment, but I recommend the tortilla way. Feel free to mess around and try adding all sorts of vegetables in. I stuck with green for the sake of the theme, and topped with jalapeno for spice and tomatoes. Preheat over to 350 degrees fahrenheit. In a large skillet, heat olive oil on high heat. Add garlic, onion, mushrooms and peppers and saute until mushrooms are cooked through and almost crispy. 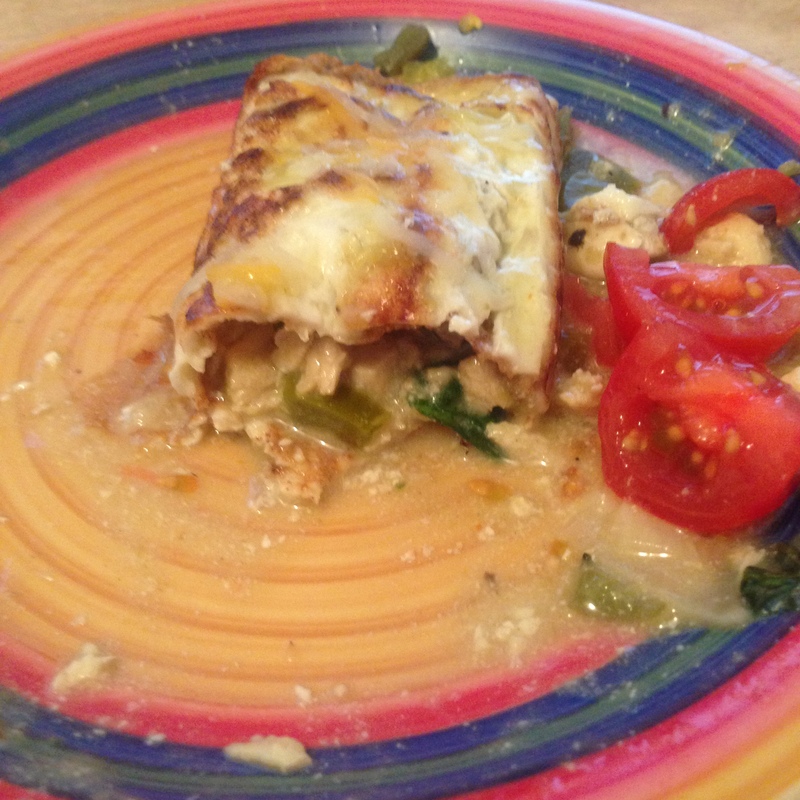 Lower heat and add chicken, green chiles, spinach and greek yogurt. Add 1/3 of the can of the chile verde enchilada sauce to chicken mixture. Stir well, and remove from heat. Lay out the tortillas, and scoop in about 1/3 cup mixture into each tortilla, rolling it up and placing it seal side down in a greased casserole dish to keep it together. Roll up each tortilla adding more/less mixture depending on how thick you prefer the enchiladas. Pour the remainder of the chile verde enchilada sauce over the enchiladas and place in over for 15-20 minutes, and top with melted cheese for the last minute. Enjoy! 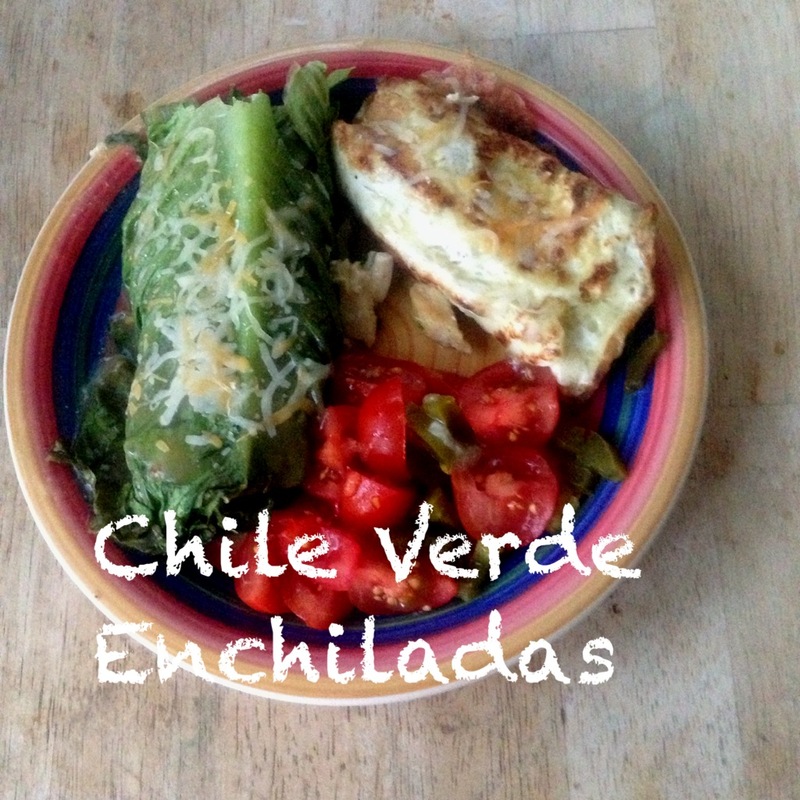 I experimented with lettuce wrapped enchiladas as well, but the alternative tortilla ones were much better. Eating a healthy diet doesn’t just take place in the kitchen. 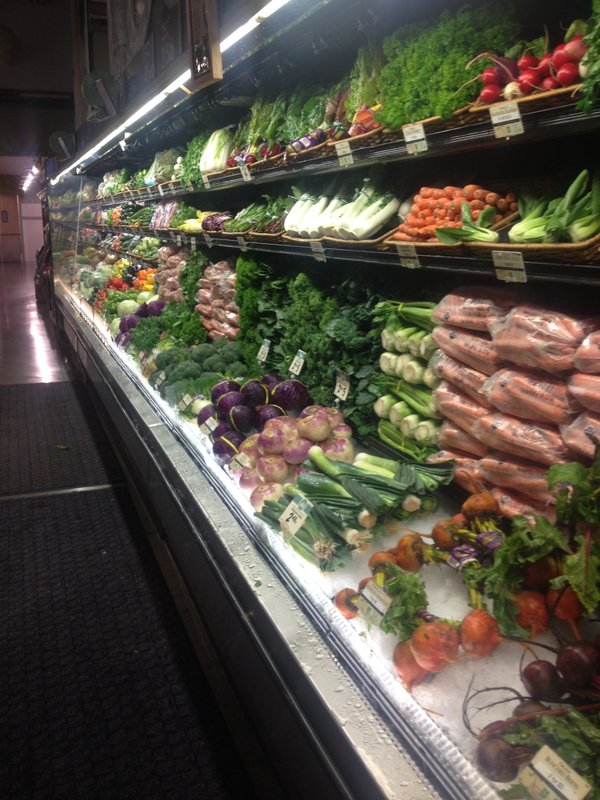 The first stop is almost always the grocery store, stocked with endless opportunities. However, it is still a business so manufacturers have smart tricks to encourage you to buy their products, and more of it. Whats at the front of the store compared to the back? 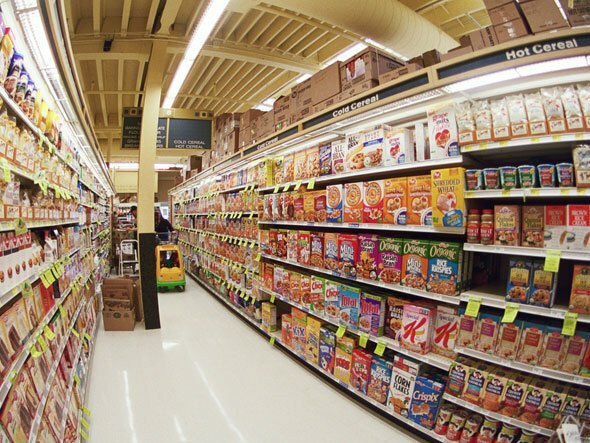 The less nutritious but colorful food stocks the front shelves with ads and coupons galore, but the basics like milk and eggs are clear at the back of the store, and spread far apart which ensures that you will have to walk past thousands of products just to get to the staples. Think you can dart down an aisle without getting distracted? If you can, you’re very talented. Manufacturers pay what is called a “slotting fee” which means they pay extra to have their products at eye level, and taking up more space horizontally so you have to pass their products or brands multiple times. Even better? The slotting fees they pay to have products at about a 3 foot high level i.e. a child’s eye level. Those aisles are a specific length as well as width, so you have to make it clear to the end if you want to turn around easily with a cart. In some stores the tiles on the middle of the aisle are made smaller, so that the cart clacking along on the floor makes it seem as if you’re going faster, so you subconsciously slow down. Which gives you more time to browse the aisles and products put there specifically to entice you into buying them. Skipping to the produce section, store owners are just as savvy there. The sprinkler systems are not there to keep the produce watered-they’ve already been picked. It is watered to keep it looking fresh and appealing so the fact that some produce has been sitting out for many hours doesn’t deter you from purchasing it. So now that you are in the store looking for the things you need, how do you know which item is best when it comes in 5 varieties? The words on the labels can be confusing, which they are meant to be so you don’t put their product down just because it contains “sugar”. So lets breakdown the label, starting with a few things to remember. Whole foods are crucial to a nutritious diet which can include bacon! 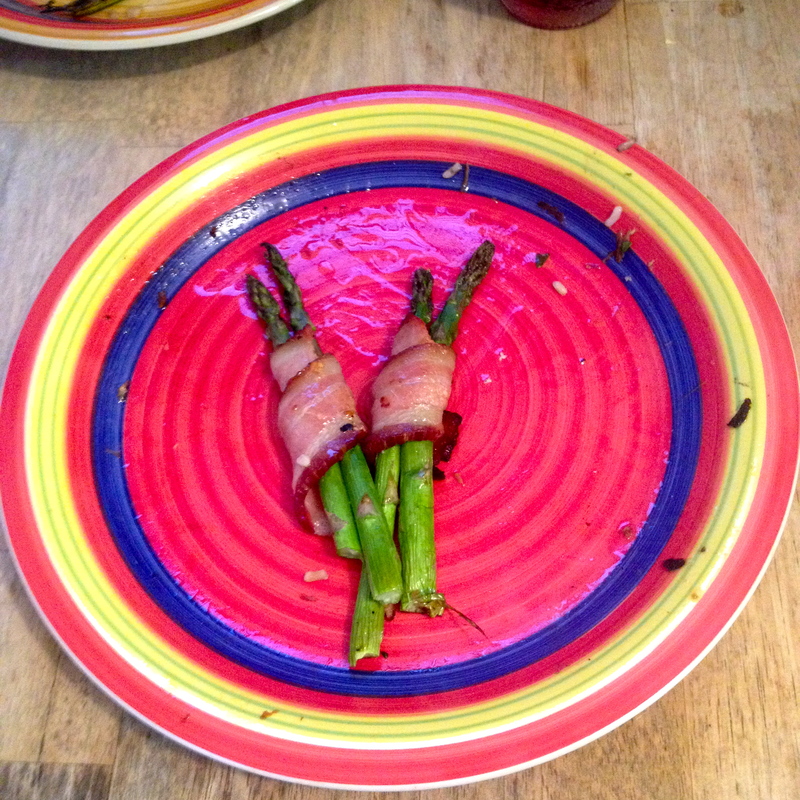 Organic asparagus wrapped in bacon. Delicious and because it is the real bacon it is very filling so small amounts are very satiating. 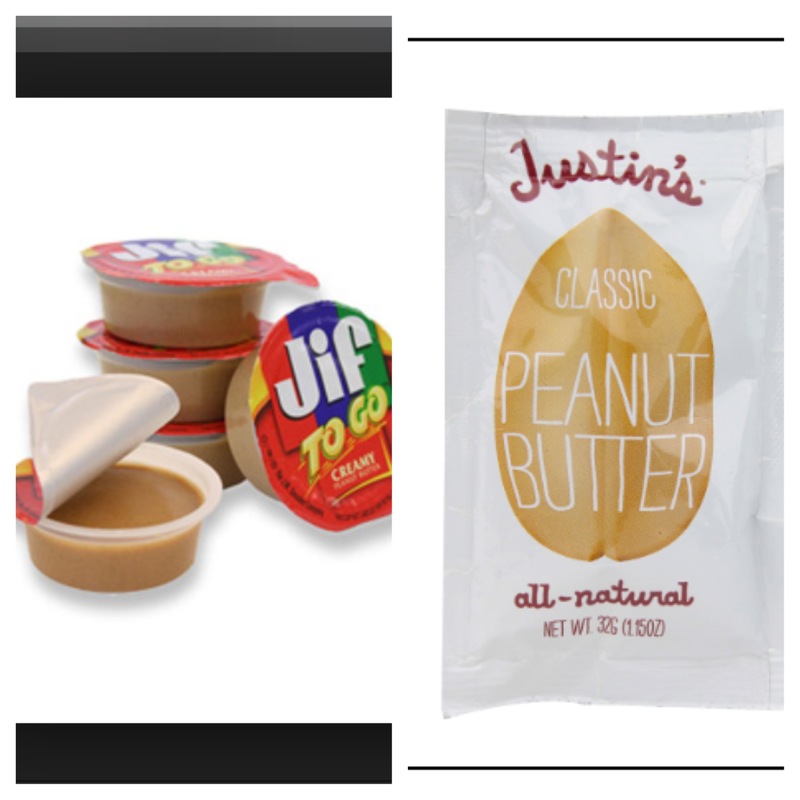 Going just off of ingredients, it is easy to see which one is a smarter pick (hint-its Justins! 2 ingredients vs. 6+) Both ingredient lists were taken directly off of the company websites. Jif To Go: Ingredients: roasted peanuts and sugar, contains 2% or less of: Molasses, fully hydrogenated vegetable oils (rapeseed and soybean), mono and diglycerides, salt. Picking the more nutritious option trumps the option that has lower calories. Have a salty craving? 1 lightly salted Quaker rice cake may only be 35 calories, but it is digested quickly resulting in a spike in your blood sugar, which will then dip and leave you tired and reaching for more empty calories. 1/2 cup plain pretzels with 2 tablespoons of hummus will leave you at around 150 calories, but with healthy fats and a little protein to keep you more full, and protein is digested slowly so you can avoid the insulin spike and crash cycle. Keeping those things in mind, keep your eyes peeled for my next post where I’ll investigate labels and what all the confusing lingo advertisers use to sell their products and what they actually mean. My favorite thing about this recipe is my cheater Aioli sauce. 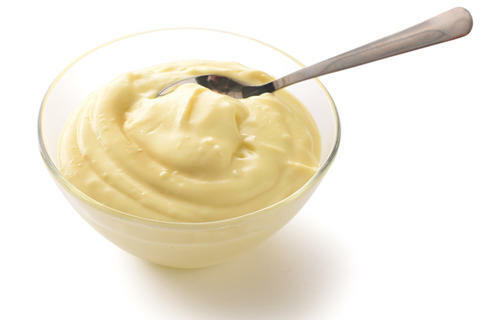 Most aiolis include mayonnaise and butter but this is a much lighter version. Tasted amazing on the fish. Any fish will taste good prepared this way but a lighter white fish will definitely taste better with this aioli addition. Directions: Preheat oven to 350 degrees fahrenheit. Brush both sides of the fish with olive oil, and season with the lemon juice and pepper. If possible, scrape off some lemon zest onto the fish, it will give it a nice punch of flavor. Place on parchment paper in baking dish and bake for 15-20 minutes or until fish easily flakes apart. For the aioli sauce, combine all ingredients and mix well. Serve with the fish, as a dip or a small amount on top. One of televisions most famous doctors, Dr. Mehmet Oz, was hauled in front of the Senate subcommittee of Consumer Protection, Product Safety and Insurance mid-June to testify on the products he promotes on his popular television show. The hearing was dealing with the regulation of dietary supplements (side note-there is relatively no regulation on these). He admitted that the things he promoted would not stand up to “scientific muster”, and his job on the show is to be more of a cheerleader than a doctor. As a fan of health related shows as well as being a health educator myself, I know how much information gets thrown into our faces every day. It is confusing and often contradicting. So what can we do about it? Here is the first of healthy recipes I will be sharing on this blog, in addition to articles and fitness tips as I go. Feel free to leave comments! Directions: Saute veggies over med-high heat until cooked almost through (onions will be opaque but not clear). Toss in chicken, rice and soy sauce. Clear a small space in the center of the pan and crack the egg in the clearing. 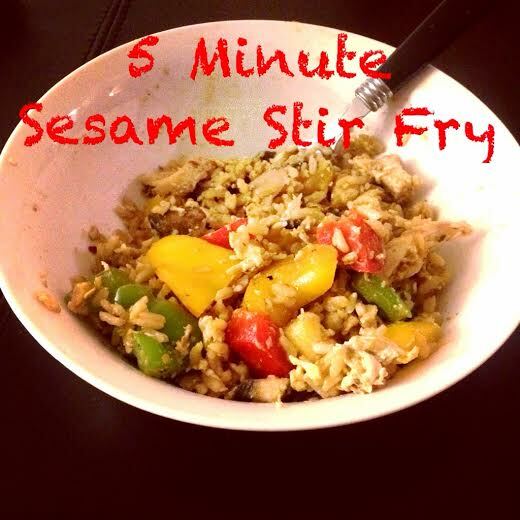 Scramble quickly and mix it into the rest of the stir fry. Season with sesame seeds and serve. 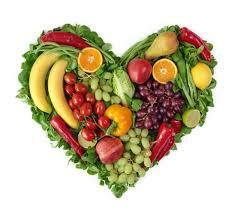 Why Does a Healthy Diet Matter? Imagine you own the most beautiful stunning mansion you can think up. Now imagine while you keep the outside pristine, the inside is a wreck-you never clean the toilets, take the garbage out, do any dishes, sweep the floor, etc. It would stay fairly nice on the outside, yet over time the inside would be a disaster. This is equivalent to eating a diet lacking in important nutrients. In today’s society we have an overwhelming array of food products and ready made meals available to us that are often over processed and referred to as “food byproducts”. Food that in no way resembles the original form because it has been so made over with additives, fat, salt or sugar that it is now an entirely different food. Often times big companies or smart labeling tricks a person into thinking whatever they are eating is super nutritious (granola bars, energy drinks, the list goes on) and have no idea the crazy amounts of stuff that goes into food that indeed is not food. The sky rocketing rates of overweight and obese Americans, especially children, reflects a correlation between increased obesity rates and consumption of processed foods in the last 20 years. But these can impact people with regular weight as well in forms of mental illness, increased stress, depression, anxiety, fatigue, physical pain, low immune system, cancer rates, reproduction; you name it and diet will play a role. However, by increasing consumption of fruits, vegetables, and low or non-fat animal products, we can vastly increase our health status and reverse the risk of disease that comes along with a poor diet. For some people, this sounds like a death sentence. For others, its old news because it is already things they are doing. I aim to show how simple it is to incorporate these foods into a normal diet that is easy to follow (no ingredients that cost $75 dollars a drop at Whole Foods) and also budget friendly. For families, introducing new foods can be difficult because children eat what they are familiar with and eat what they like. Studies have shown over time increasing a child’s exposure to new foods increases their consumption of new foods, as well as their willingness to try new and unfamiliar foods in the future. There is no perfect answer, no miracle product, no one stop solution that will fix these problems overnight. It is lifestyle changes that can be introduced slowly and correctly to insure you are preparing yourself for a healthier lifestyle, starting with the plate in front you. Fuhrman, J. (2011), Super Immunity: The Essential Nutrition Guide for Boosting Your Body’s Defenses to Live Longer, Stronger, and Disease Free. Harper Collins, 304 pages.